SEPT. 23 -GulfCoast marina operators are battening down as best they can for the onslaught of a powerful Hurricane Rita. Coastal marinas this week are busily preparing for the hurricane by hauling and securing boats, lashing down awnings, boarding up windows, and removing outdoor furniture and other items that can become projectiles in a hurricane’s raging winds. “I know several marina managers down there and I am sure they are doing everything they can to keep everyone safe and all the boats secured,” says Jeff Rose of Marinas International, a national marina chain which has two marinas located on inland lakes in Texas. 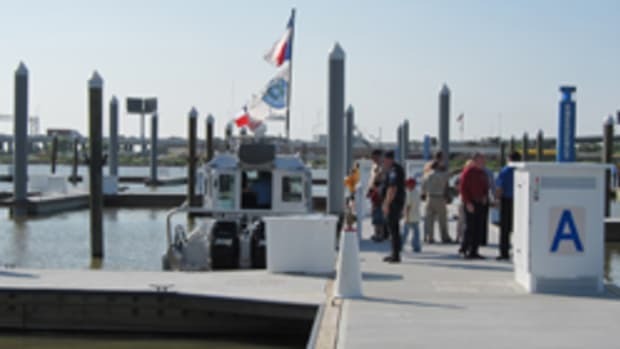 “We are wishing everyone on the Gulf Coast well and are looking forward to seeing everyone back on the water soon,” says Rose, a past president of the marina association. Rose adds that even marinas located on inland lakes are preparing for the storm, which will lose strength as it crosses land but can still pack a powerful punch. As of Thursday, hurricane warning had been issued from Port O’Connor, Texas, to Morgan City, La. A hurricane warning means hurricane conditions are expected within the next 24 hours. The White House, which was criticized for its initial handling of Hurricane Katrina, says emergency response teams, along with food, water, ice and other supplies, have been mobilized to Texas. The Coast Guard has been securing ports, and the Coast Guard Auxiliary has repositioned boats and aircraft to be ready to respond after the hurricane passes. Forecasters say Rita could dump up to 15 inches of rain on Texas and up to 4 inches in the New Orleans area, which could overwhelm the city’s fragile levee system. As of Thursday, Rita remained a potentially catastrophic Category 5 hurricane. Only three Category 5 hurricanes have made landfall in the United States, including Andrew in 1992, Camille in 1969 and an unnamed storm that hit the Florida Keys in 1935. Galveston was already the site of one of the deadliest hurricane in U.S. history. At least 8,000 people died, according to the National Hurricane Center, and the island was flattened by a hurricane in 1900.